A powerful earthquake struck central Philippines early Tuesday, killing at least 32 people and wounding many more. The quake, which registered 7.2 on the Richter Scale, struck in the island of Bohol, a popular tourist resort. 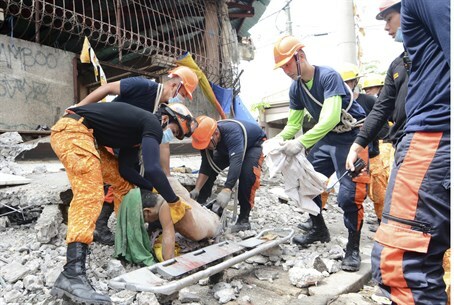 Officials claimed most of the dead were in Philippines' second city of Cebu, where unconfirmed reports said a school had collapsed. "There are still tremors and aftershocks," Bohol Gov. Edgar Chatto told ABS-CBN television news in the capital Manila, adding that "We are monitoring all the areas in the province with our disaster teams." In addition to the damage wrought by the earthquake itself - including collapsed buildings, landslides and the leveling of whole marketplaces, many residents are said to fear the prospect of a tsunami striking the island as a result of the severe tremor. However, the Pacific Tsunami Warning Center has said that there is currently no significant threat of a tsunami. As is often the case with earthquakes and other natural disasters, local officials expect the death toll to increase in the coming hours and days as many victims may still be buried under mudslides or the rubble of collapsed buildings. The Philippines is no stranger to earthquakes. It is located within the "ring of fire" - a belt of seismic activity including volcanoes and earthquakes - and has experienced many such tremors in the past. Most recently, in August 2012 a 7.6-magnitude earthquake struck close to the island of Samar, destroying buildings, cutting power and triggering tsunami evacuations.